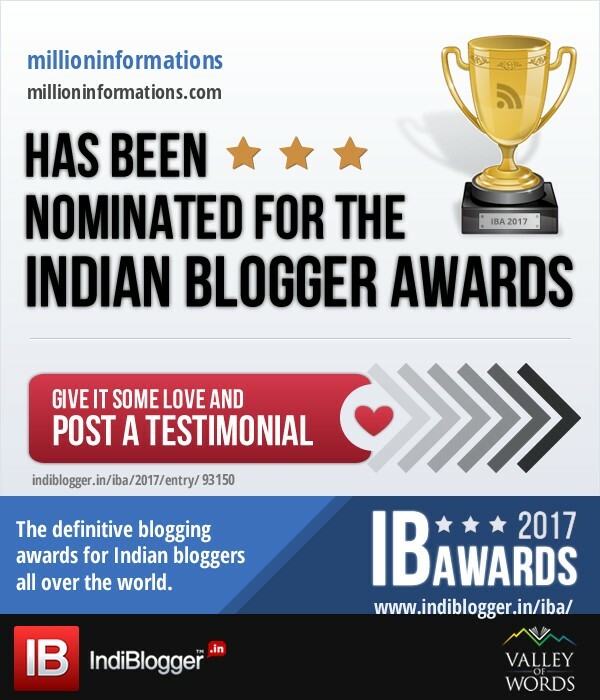 In this post, I am going to say something about Mother Teresa who was the most awesome person in the history of India. Mother Teresa was one of the unbelievable legends; no one can’t think like or be like her. She was one of the great humanitarians who helped for the poorest of poor (persons who were rejected by others, unwanted unloved persons). She strongly believes that God would use her to serve people and she felt that God calls her to help disabilities, half died peoples affected by many incurable diseases etc. What a lovely words from her and she had taken more and more efforts for completing God’s order. She believed that God lives among the poorest of poor. She was the most inspiring people in the world. She is the master of peace and love. She delivered pure Christ of love to each and every person. Mother Teresa was an important unique person in society. She had proven that love will change and cure anything in a positive manner. She only changed the way of treating unloved, uncared persons and peoples affected be incurable diseases like AIDS, leprosy etc and put her great effort to serve them. She helped the dying peoples to enter into the heavens. Most of us know about her or heard some information about her. But what’s her history? her birth place, family details, when she chose her missionary ideas are not known to some persons. In this post, I will give some useful information about Mother Teresa. Everyone will respect her strong perseverance, helping ability and continuous serving for poor. Mother Teresa was born on August 26, 1910, in Skopje (Ottoman province of Kosovo now the capital of Macedonia). Her parent’s name was Nichola and Dranafile Bojaxhiu. Her father was an entrepreneur who worked as a construction contractor and a trader of medicines and other goods. Her Parents named as Agnes Gonxha Bojaxhiu to Mother Teresa. Her parents had three children and she was the last. Her family was of Albanian descent and they were Catholics. In 1919, her father died at that time she was 8 years old. The cause of death is not particularly known, many have said that political enemies poisoned him. Mother Teresa attended Convent-run primary school and State –run the secondary school. At the age of 12, she strongly felt the call of God and inspired to help poor. She knew that she had to be a missionary to spread the love of Christ. She decided to train for missionary work in India. At the 18th age (1928) she left her parental home and joined the Sisters of Loreto, an Irish community of nuns in Rathfarnham with missions in Calcutta, India. The Sisters of Loreto were providing education for girls. She received training in Dublin and Darjeeling in India. In Ireland, she learned The English Language. She had taken her first religious vows in 1928. In 1931, she chose the name Sister Mary Teresa from St. Theresa of Lisieux (1873 – 1897, a nun who served in past years inspired by Agnes). From 1931 to 1948, Mother Teresa taught geography and catechism at St Mary’s High School in Calcutta. She became its principal in 1944. In 1948, Mother Teresa saw a half dead woman lying in front of a Calcutta hospital. The painful situation of the woman touched Mother deeply. From then on she decided to help the poorest of the poor in India. Selfless work gave her the name ‘Saint of the Gutters’. She got permission from Pope Pius XII () via the Archbishop of Calcutta to leave the convent school and live as an independent nun. She took up the short course with the Medical Mission Sisters in Patna and then returned to Calcutta. She started an open-air school for homeless children. Many voluntary helpers joined in her mission. She also received financial support from church organizations and the municipal authorities. On October 7, 1950, Mother Teresa received Vatican permission to start her own order. The Vatican had originally labeled it as the ‘Diocesan Congregation of the Calcutta Diocese’. Later it changed to ‘The Missionaries of Charity’. Its primary task was to love, care and to help people who are homeless or have been left alone. Mother saw the glimpse of God in everyone that she met. Whether they were dying of AIDS or affected by harmful diseases. She wanted them to be able to die in peace and with dignity. ‘Keep the joy of loving the poor and share this joy with all you meet. Remember, works of love are works of Peace. God Bless You’. Mother learned some basic medicine and went into the homes of the sick to treat them. She found men, women, and children who were rejected by local hospitals and dying on the streets, she rented a room for those peoples to live there till they die peacefully. It is named as ‘Home for the Dying’ founded in a former temple Calcutta in 1952. After this, she formed many homes for peoples dying of AIDS, alcoholics from Calcutta to New York (Albania). In 1966, the Missionaries of Charity Brothers was founded. In 1971, the first home in the United States was established in the south Bronx, New York. Today, the Society of Missionaries has spread all over the world, including the former Soviet Union and Eastern European countries. This Society helps the people affected by diseases and poor, it also undertakes relief work in floods, epidemics, famine and for refugees. She was affected with Heart Attack in 1989 while visiting the John Paul II() in Rome. Then second time affected in 1989 and received an Artificial Pacemaker. In 1991 in Mexico she was battled with pneumonia and then further affected with heart problems. In April 1996, she was affected with malaria and failure of left heart ventricle and affected with many problems at that time of her death. Mother Teresa was first recognized by the Indian Government, awarded the Padma Shri in 1962.
for International Understanding and work for South or East Asia. She received Jawaharlal Nehru Award for International Understanding in 1969. Mother Teresa received The Pope John XXIII () Peace Price in 1971. She received The Balzan Prize in 1979. In 1980, Mother Teresa received India’s Highest Civilian Award Bharat Ratna. Mother Teresa received the Nobel Prize for Peace in 1979. In 2003 she was beatified (A dead person’s entrance into heaven) by Pope John Paul II and recognized as “Blessed Teresa of Calcutta”. Her official biography was written by an Indian civil servant, Navin Chawla published in 1992. The great God’s flower died on September 5, 1997, in Calcutta. A great hard working human being was got entered into the Heaven. By citizenship, I am an Indian. 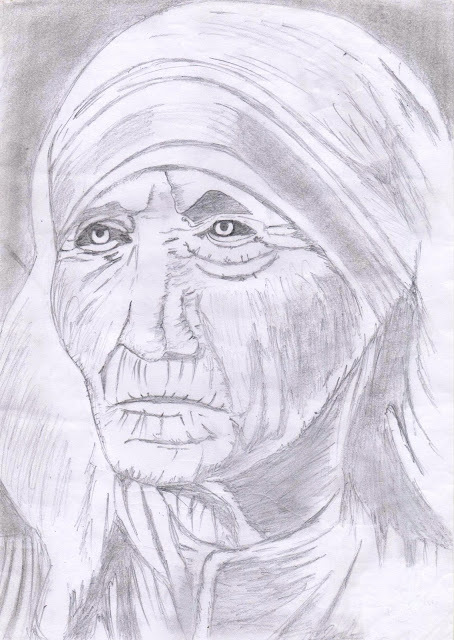 This Pencil sketch of mother Terasa drawn by my friend R Jegan B.E EEE , thanks for his contribution in this post.